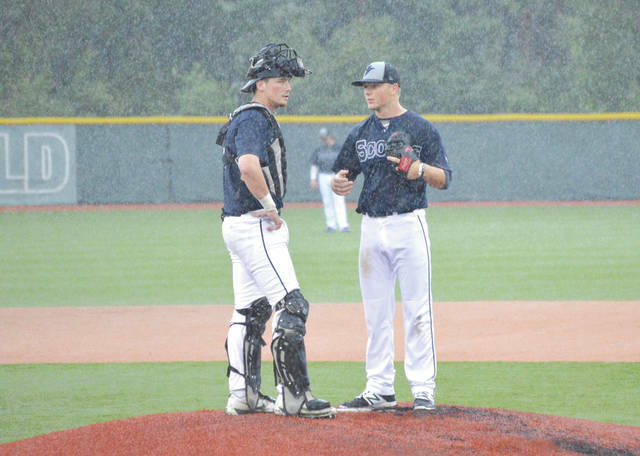 Xenia Scouts catcher Connor Regan (left) confers with pitcher Benjamin Bills during a June 12 game at Grady’s Field in Xenia. 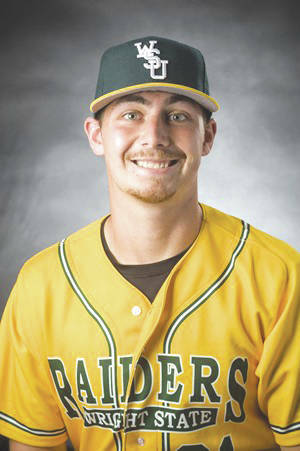 The Wright State University player was recently named Player of the Week in the Great Lakes Summer Collegiate League. XENIA- Mother Nature decided she did not want the Xenia Scouts to play all of their games last week. However, three games were enough for Connor Regan to earn the Great Lakes Summer Collegiate League’s Player of the Week honors, the league announced June 26. Regan, a catcher and designated hitter for the Scouts, had an impressive week. He played in three games, collecting five hits, two doubles, a home run and six runs batted in. He also walked four times and scored six runs. His batting average during that time was .625 . Out of the three games, the Scouts won two and lost one, which is much more important to Regan than earning his award. The Scouts have now played 12 games out of a 40-game season. After an 0-3 start, they now have an even 6-6 record, and will look to continue to improve and win games throughout the remainder of this season. For Regan, the formula for his continuing contribution is rather simple. Regan plays college baseball at Wright State University. The Raiders program has seen an abundance of success in recent years, including a 2018 Horizon League championship and a trip to the Stanford Regionals of the 2018 NCAA Division I baseball tournament. Regan is from Sagamore Hills, and attended Walsh Jesuit High School in Cuyahoga Falls. Story written by Luke Severt, a team correspondent for the Xenia Scouts.